John Burroughs, executive director of the Lawyers Committee on Nuclear Policy and the U.N. Office of the International Association of Lawyers Against Nuclear Arms (IALANA), told IPS the Marshall Islands and its legal team strongly encourage other states to support the case, by making statements, and by filing their own parallel cases if they qualify, or by intervening in the case. Burroughs, who is a member of that team, said the ICJ, in its 1996 advisory opinion, held unanimously that there exists an obligation to pursue in good faith and bring to a conclusion negotiations on nuclear disarmament in all its aspects under strict and effective international control. The nine nuclear states include the five permanent members (P5) of the U.N. Security Council, namely the United States, the UK, France, China and Russia, plus India, Pakistan, Israel and North Korea. Burroughs said three of the respondent states – the UK, India, and Pakistan – have accepted the compulsory jurisdiction of the Court, as has the Marshall Islands. For the other six states, he said, the Marshall Islands is calling on them to accept the Court’s jurisdiction in these particular cases. “This is a normal procedure but the six states could choose not to do so,” said Burroughs. 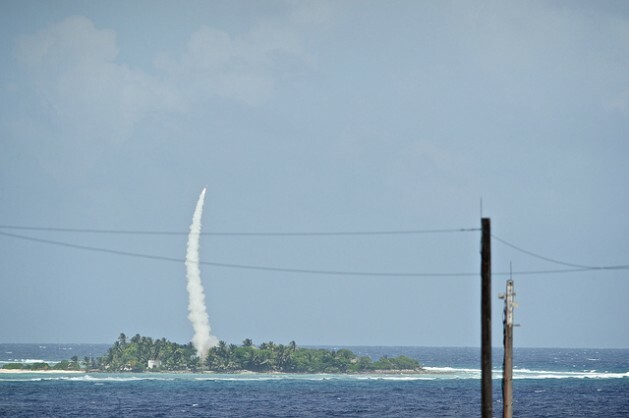 Between 1946 and 1958, the United States conducted 67 nuclear weapons tests, triggering health and environmental problems which still plague the island nation. The continued existence of nuclear weapons and the terrible risk they pose to the world threaten us all, he added. The suit also says the five original nuclear weapon states (P5) are continuously breaching their legal obligations under the Nuclear Non-Proliferation Treaty (NPT). Article VI of the NPT requires states to pursue negotiations in good faith on cessation of the nuclear arms race at an early date and nuclear disarmament. India, Pakistan, Israel and North Korea are not parties to the treaty. But the lawsuit contends that all nine nuclear-armed nations are still violating customary international law. Far from dismantling their weapons, the nuclear weapons states are accused of planning to spend over one trillion dollars on modernising their arsenals in the next decade. In a statement released Thursday, Archbishop Desmond Tutu of South Africa said, “The failure of these nuclear-armed countries to uphold important commitments and respect the law makes the world a more dangerous place. “We must ask why these leaders continue to break their promises and put their citizens and the world at risk of horrific devastation. This is one of the most fundamental moral and legal questions of our time,” he added. Burroughs told IPS the United States maintains that it is committed both to the international rule of law and to the eventual achievement of a world free of nuclear weapons. “The United States should defend the case and widen the opportunity for the Court to resolve the wide divide of opinion regarding the state of compliance with the disarmament obligations,” he added. The other five states which have not accepted the compulsory jurisdiction of the Court are being asked to do likewise. As to the case against the UK, a key issue is whether the UK has breached the nuclear disarmament obligation by opposing General Assembly efforts to launch multilateral negotiations on the global elimination of nuclear weapons, said Burroughs. For India and Pakistan, because they are not parties to the NPT, the case will resolve the question of whether the obligations of nuclear disarmament are customary in nature, binding on all states.